About 3 weeks ago Kristina Werner’s MACM (Make a card Monday) was a Gift Card Holder (check out KW’s video tutorial here) which I thought the most clever, cute, useful and gorgeous papercraft creation I have ever seen. Thank you so much Kristina for the fabulous ideas! And so, I set out to make a few of my own. I made them using the delicious Holiday Harmony DSP and the coordinating colours and ribbons that go with that paper. 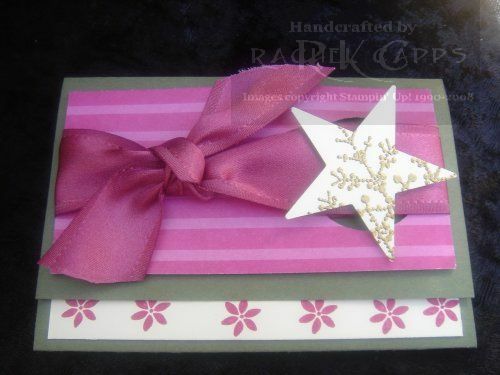 I thought it was the perfect time of year for a Christmas Gift Card Holder! 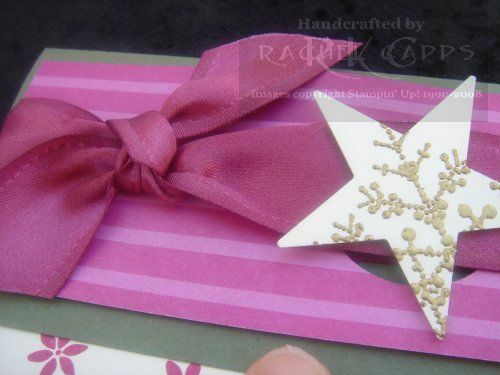 I will also include 3 of them in my upcoming World Card Making Day event on Friday 10 October 2008 at 8.00pm – a class to make a Christmas Bag, Christmas Gift and three of these Christmas Gift Card holders at my home in Parklea. Bookings are essential so email to book your place me today. One of my dearest friends recently gave birth to a baby boy, Brynn (I love and adore his name!). This is the card I made to welcome Brynn to the world and his special family. I hoped to create the image of a ball with a ribbon around it … although I’m not quite sure it really works. I used the masking technique for the ball and the colours I sponged in are Bashful Blue, Apricot Appeal and Certainly Celery. I stamped the rattle from All Year Fun and had to use my Dazzling Diamonds to make the rattle stand out more. Then I used the ever so clever So Many Sayings Hostess stamp set with my Ballet Blue marker pen to stamp the sayings “It’s a Boy” and “Welcome”. I couldn’t have lined these sayings up so well without my Stamp-a-ma-jig either. I really love this next card. I love its simplicity. And I love the Dazzling Diamonds! In fact, I think the first card needs Dazzling Diamonds too! What do you think? 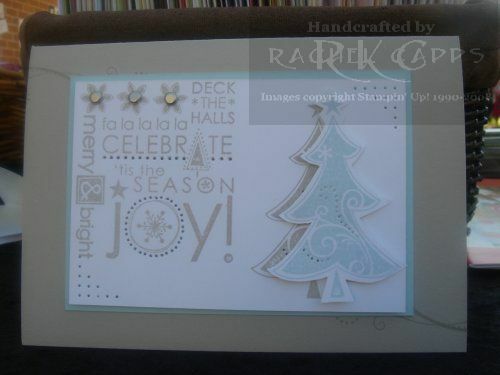 Both cards use the Season of Joy stamp set available in the Spring Mini catalogue. It is an awesome stamp set! 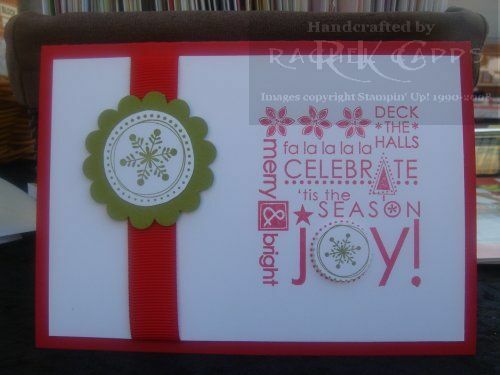 There are so many different ways you can create your own Christmas cards from one stamp set. Email me today to order your own Season of Joy stamp set. 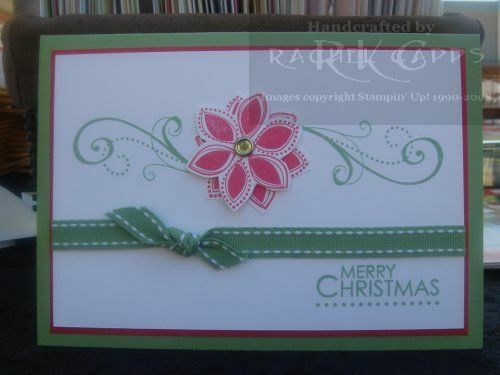 This card is completely cased from Splitcoaststampers but try as I might I couldn’t find it again, thank you for the inspiration whomever originally created this card (found it! go here)! I love the colours which I think are great for Christmas … Real Red and Wild Wasabi! The second card was also inpsired from splitcoaststampers. Look at this link to see the original card here. Thank you Lynda for the inspiration! 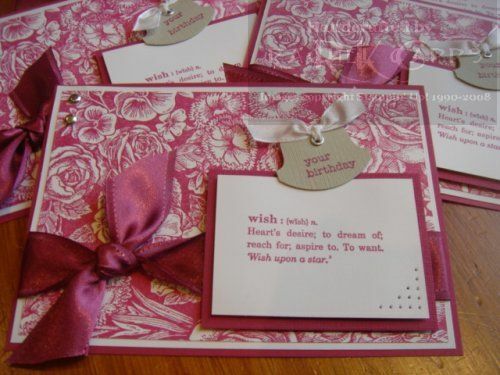 I love the soft tone of this card. I used Sahara Sand with Soft Sky. Great colours! I hope the ladies on Sunday love these cards as much as I do! If you would like to book a stamp-a-stack with me you just need to organise a minimum of 4 friends together and you too could be making these cards one evening catching up with family and friends! Email me today to book a date as my available dates are booking up. Tomorrow Jo and I will be running a Stampin’ Up! stall at the local Barnier Public School Spring Fete. Come and visit us if you’re in the area! I’m really looking forward to it and I’ll show you over the next few days some of the things I have made for the day. 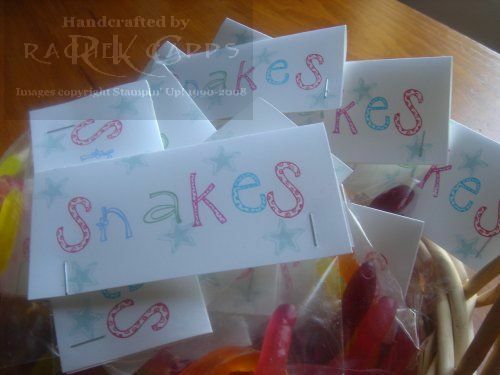 This is the first bundle … a basket of snakes! I hope there will be enough! We’re off to our neighbour’s 30th birthday party tonight. 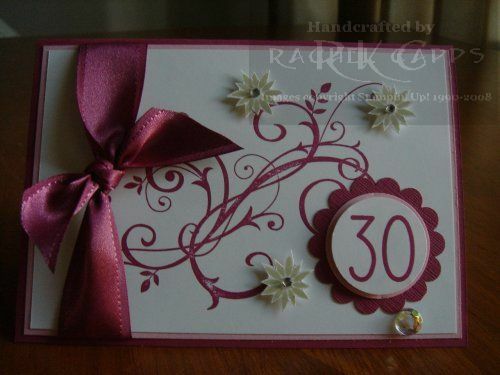 This is the birthday card I made for her using Baroque Motifs. What a simply divine stamp set! 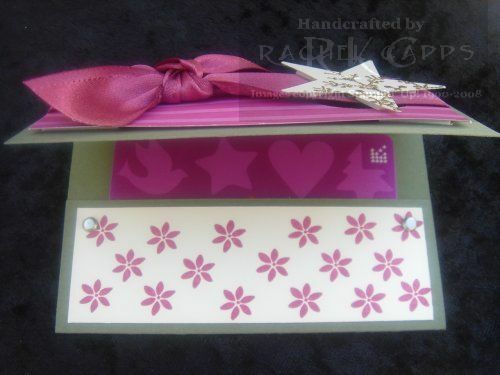 I don’t think anyone could go wrong making a stunning card with this stamp set. I’m afraid I’m stuck on Purely Pomegranate at the moment … I love love love the colour and the satin ribbon is new so I simply must use it! I’ve used Pretty in Pink and River Rock with Purely Pomegranate this time. 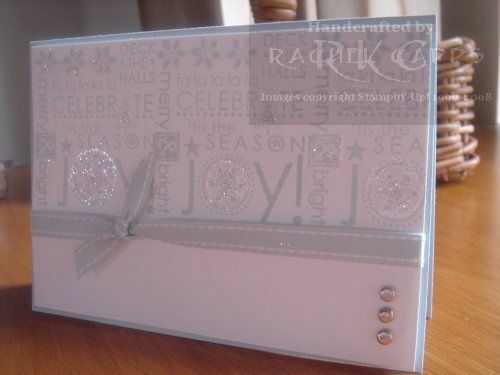 I’ll try a different colour combo soon … because Christmas is on the way and it’s time to start making Christmas cards! If you are interested in booking a stamp-a-stack for Christmas cards (10 cards, 2 different designs) with me, email me today for more info and to book in a date! Phew! I’ve had a great day, despite the poor weather, at the Stampin’ Up! Sydney Regional training in Darling Harbour today. One of the many fun things we do at training are “swaps”. This means we make a stack of cards and we “swap” them with each other. When you look at someone else’s swap you suddenly find out new ways to use stamps or a particular stamp set you had never thought of before. It’s great fun! Thank you to everyone who swapped with me! I hope you liked my swap.